Sept. 4, 2015: International Space Station Configuration. The Soyuz TMA-18M spacecraft is docked to the Poisk mini-research module. The Soyuz TMA-16M spacecraft is docked to the Zvezda service module. The ISS Progress 60 spacecraft is docked to the Pirs docking compartment. The Soyuz TMA-17M spacecraft is docked to the Rassvet mini-research module. 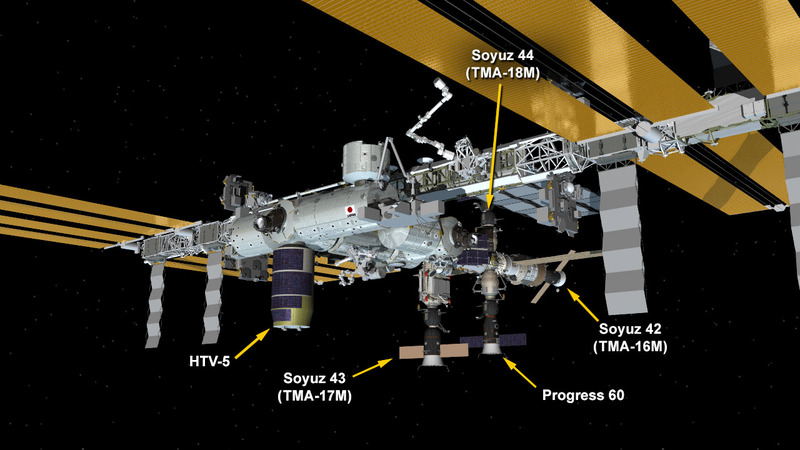 Japan’s “Kounotori” HTV-5 is berthed to the Harmony module. The Soyuz TMA-18M vehicle docked to the International Space Station’s Poisk module at 3:39 a.m. EDT, above eastern Kazakhstan. Aboard the space station, Expedition 44 Commander Gennady Padalka of Roscosmos, as well as Flight Engineers Scott Kelly and Kjell Lindgren of NASA, Flight Engineers Oleg Kononenko and Mikhail Kornienko of Roscosmos, and Kimiya Yui of the Japan Aerospace Exploration Agency (JAXA) will welcome Soyuz crew members Sergey Volkov of Roscosmos, Andreas Mogensen of ESA (European Space Agency) and Aidyn Aimbetov of the Kazakh Space Agency when the hatches between the two spacecraft are opened. Watch the hatch opening and welcome ceremony live on NASA TV beginning at 5:45 a.m.: https://www.nasa.gov/nasatv. This Soyuz flight carries with it equipment to be used in research investigations planned aboard the orbiting laboratory. One item, the European Space Agency’s (ESA) Skinsuit, will help astronauts counteract potential back problems in microgravity. Some astronauts’ spines have been shown to lengthen as much as 7 cm in weightlessness, which can cause pain. The Skinsuit resembles overalls that are specially designed to simulate gravitational forces from Earth to constrict the body from shoulders to feet. ESA astronaut Andreas Mogensen will test the suit for the first time in space as part of his space station mission. Several investigations aboard the space station employ dosimeters to gather information about space radiation to manage exposure and provide protection to crew members, and more dosimeters are traveling to the station on this Soyuz. The Area Passive Dosimeter for Life-Science Experiments in Space (Area PADLES) investigation helps researchers collect data to design radiation monitoring equipment for astronauts. This knowledge may improve design for spacecraft structures that shield internal occupants from radiation. Scientists also may use the data to develop protection devices for people who work in medical or industrial areas with potential radiation exposure.